My four-year-old always manages to surprise me with her prayers. She keeps them fresh. What rolls off her tongue is what is just rolling out of her heart and mind. We do this nightly round-robin of prayers as a family. Mostly, my family slips easily into a rut of prayers. I can tell you what one of my daughters will pray almost word-for-word every…single….night. Not only does she stick to the same verbal prayer routine, she has taken to praying at lightning speed, like she gets extra spiritual bonus points for crossing the finish line of “Amen” in record time. Prayer should be more than that, right? This message is for me. I don’t want to trek over those same prayer grooves night after night. I don’t want to pray out of “should” or “must” or spiritual duty, doing little more than checking off that sacred to-do-list. Prayer should be this great passion. Too often, we forget this: That we are granted access before the very throne of our Mighty God by the grace of our Savior. Prayer brings us into His presence. It’s beautiful and intimate and it should knock me right off my feet really to realize that a God so great could care about the tiniest needs of my simple soul. So, how to help us all shake off the routine of prayer? How to remind myself and my kids that we should be praying for our missionaries, our church leaders, our government, our teachers, our friends and family in addition to our own little needs? I saw this idea shared at The Women’s Bible Cafe and had this moment of, “Oh my goodness, this is the best idea ever.” It’s not something I could just pin on Pinterest and never turn into reality in my own home. This was something that needed to actually happen. 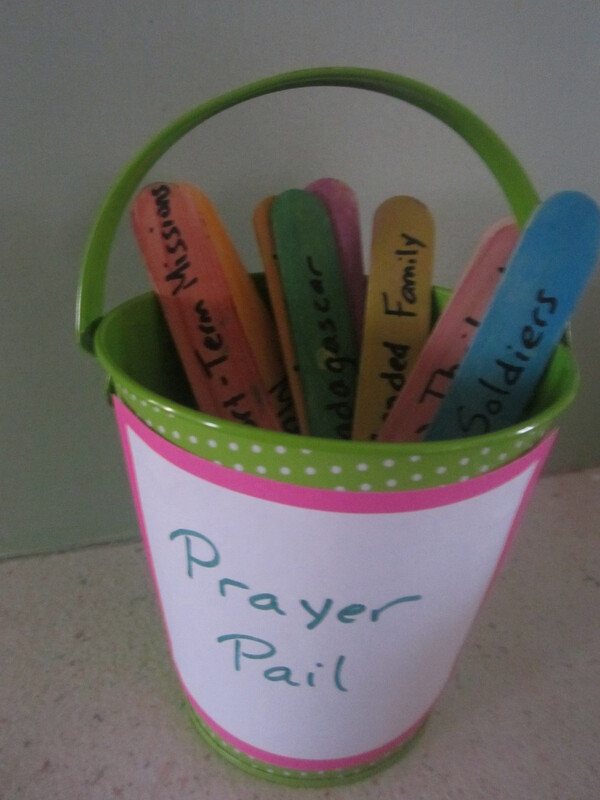 Delfina Salas, the mom who inspired this awesome idea, gave me permission to make my own prayer pail and share the results with you. At dinner, they choose one Popsicle stick and pray for whatever is written on it. Some of you might use prayer calendars in a similar way to help you remember to pray for a variety of needs. But me? A mom with four young kids? Popsicle sticks with prayer requests seems like a good fit! So, here’s our prayer pail…. We included each family member, extended family, soldiers, government leaders, teachers and schools, pastors and church leaders, and three different missionary families we know from our church. The first thing I want you to do is pray. Pray every way you know how, for everyone you know. Pray especially for rulers and their governments to rule well so we can be quietly about our business of living simply, in humble contemplation. This is the way our Savior God wants us to live (1 Timothy 2:1-3 MSG). Thank you so much, Delfina, for the suggestion and allowing me to share this idea with others! Have you found ways to revive your prayer life or help your kids learn how to pray for others? Wonderful idea. Need to find a bucket and some sticks. Blessings.